All of my life I have loved reading above all else. 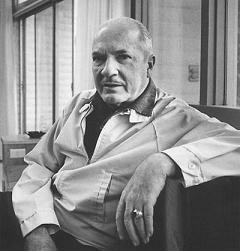 One of my favorite authors that has really helped to color my perspective is Robert Heinlein. He wrote throughout the mid-twentieth century and preached through his narratives that we should always keep our minds open and be willing to listen to, if not accept, every point of view. His philosophy can be wonderfully summed in his statement: "I never learned from a man who agreed with me." In this short sentence Heinlein reminded us that we have much to learn from one another and that disagreement and discussion can often lead to remarkable improvements and ideas when we allow ourselves to be open to the possibility that someone else might actually know what they"re talking about better than we do. I first read these words when I was 21 and, though I didn't think much about it at the time, I have carried it through my life and into my career and into my relationships. Sometimes the hardest part of a relationship (personal or professional) can be just biting your tongue and listening to another point of view, but if we can manage this we can gain not only a new perspective, but also the gratitude of the people we have shown this small measure of respect.